A beautiful addition to the foot of any bed, our handcrafted Manitoba Mission Blanket Chest is sure to provide plenty of charm and extra storage space to any suite in the home. 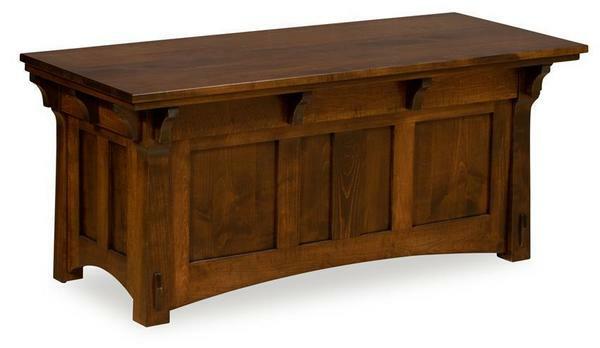 The beautiful design of this blanket chest draws influence from a classic Mission style, with through tenon feet, bold panels on the front and sides, and corbel accent pieces that line the top. Taken a step further, the splayed legs, bold arches and large top add a rustic, yet modern flair that is sure to have presence in any decor. The large top is mounted with high-quality hinges and opens to reveal plenty of storage for blankets, linens, and anything else you may need to keep handy for the night ahead. Customize this chest to match you space - with an array of hardwood and finish options to choose from, you're sure to find the perfect combination to complement any bedroom suite. We also have stain samples available so you can be sure your new blanket chest will be a match to your existing furniture. Please call one of our Furniture Specialists today to answer your questions, request stain samples, and start your order by phone. Very high quality cabinet. Beautifully crafted.